Somehow I did not know the challenge was posted, so I am late! But here is my creation. The colors are: Baja Breeze, So Saffron, More Mustard, White and Sahara Sand. I used Designer Series Paper from Urban Garden and Delicate Dots. The image is stamped from the Always set. I haven't used the bird before, so that was fun. I used my Curly Label Punch to make the corners in More Mustard. This card also fits the Midnight Madness Sketch Challenge #1. 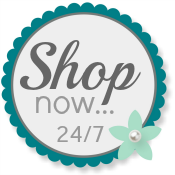 Please shop with me 24/7 for all of your Stampin' Up! needs. What a lovely card! Great job with the sketch & I love the soft colors :) Hope to see you in this week's challenge! Oh wow, I just love your card! Wonderful use of those colors. Wow! THis is stunning, I can never find a good way to use that bird, you have perfected it! You are on a roll, girl! This card is fantastic! I saw this color challenge and had it out for days but couldn't think of a way to execute it. You did such a fabulous job! This card is beautiful and very well put together. Love it! I love the layout on this card - but I especially love what you did with the curly label punch in the corners. Very clever!